An All-American Superstar, the Miami luxury car rental presents you, the Audi R8 Spyder. Be prepared to be dazzled by this masculine one. However, do not be surprised if you later fall in love with its charming feline touch. This is power meeting finesse. With the idea of a powerfully built American car in all aspects, the Audi R8 Spyder’s body is built with an ultra lightweight tech and ASF aluminum construction. The decrease in weight allows the R8 Spyder to have better speed performance, shorter breaking distance, and more reactive maneuver. These improved qualities are further maximised by the stunning 430 horse powered V8 engine. If you are looking for more power, there is another available version of R8 Spyder with 525 horse powered V10 engine. Installed with an all-wheel drive, the R8 Spyder can detect every road situation, and channel power automatically to the wheels that need power most. You need not worry too about its safety since it has a carbon fiber-reinforced ceramic brakes that is resistant to heat and fade. The Audi R8 Spyder is infused with a vivid elegance. Start from the front part of the body. The Full LED front headlight is designed with a flowing and smooth look, but a clarity that is sharp and crystal-clear. The interior is a combination of brushed aluminum and smooth black leather. This is elegance at its best. In addition to the sensational look, the Audi R8 Spyder has a technology that ensures practicality and comfort. The built-in MMI navigation plus system is an accurate GPS system that prevents you from getting lost anywhere you go. To spice everything up, Audi gives you the best speakers in town, the Bang and Olufsen. A premium audio system with 12 speakers are ready to pleasure your ears. 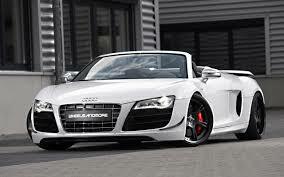 Be prepared to experience an awesome driving time with the Audi R8 Spyder for rent in Miami luxury car rental garages. This is power meeting finesse at your service.